Objective:To assess the predictive performance of the current reference values of peak systolic velocity of middle cerebral artery (MCA-PSV) in the detection of various degrees of fetal anemia in Rh-alloimmunized Egyptian women and to evaluate pregnancy outcome after prenatal treatment with ultrasound guided intrauterine fetal blood transfusion. 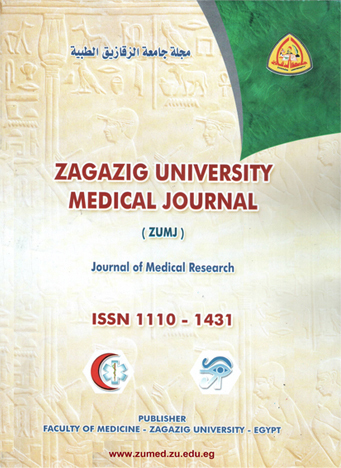 Materials and Methods: In a prospective study, 33 Rh-alloimmunized Egyptian women were evaluated by fetal MCA-PSV. MCA-PSV, intrahepatic umbilical venous maximum velocity (IHUV), liver length, and spleen perimeter were measured. Results before first fetal blood sampling or delivery were analyzed. Perinatal outcome was also recorded. Results:Thresholds of ≥1.50 and ≥1.55 MOM's MCA-PSV were evaluated with all degrees of fetal anemia. For predicting moderate and severe anemia(Hb ≤0.65 MOM's), MCA-PSVof ≥1.50 MOM's has a 90.6% sensitivity, 55.0% specificity with positive likelihood ratio of 2.01 and negative likelihood ratio of 0.17 while IHUV maximum velocity sensitivity was 75%, specificity was 54%, +ve likelihood ratio was 1.4 and -ve likelihood ratio was 0.54.Sensitivity was obviously low for spleen perimeter and liver length (54%-32% respectively),also their specificity was (32%-33% respectively) in predicting moderate and severe anemia. By addition of IHUV velocity to MCA-PSV, has slightly increased test sensitivity to 94.44, almost same specificity 54.5% and predictive performance (+velikelihood ratio=2.08) and lowered false negative values. Total loss was 16/33 (48.5%) of which 25% (4/16) had miscarriage (fetal loss < 24 week) and 12 cases (36.3%) were early neonatal death in the first week of life. Ten fetuses were anemic by MCA-PSV follow up and required intrauterine transfusion. The total number of transfusions done during the study period was 23 times. Of the 10 pregnant women who required IUT, 4 fetuses (40 %) had died; 1 due to complicated IUT (fetal bradycardia) and 3 had miscarriage due to early severe fetal hydrops. Eighteen cases needed exchange transfusion within 7 days of birth. Conclusion:It can be concluded that MCA-PSV has limited diagnostic accuracy for the prediction of moderate to severe fetal anemia in Rh-alloimmunized women. Although, it appears superior to other ultrasonographic parameters they need to be interpreted cautiously. Further work should be undertaken to develop test combinations and improve its diagnostic accuracy.